Angelica and Myriam drew these drawings today. 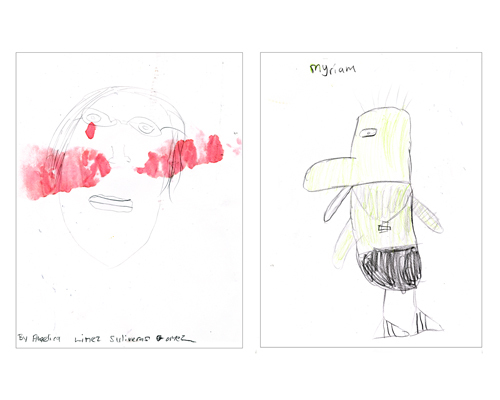 I promised I would post their drawings tonight on my blog so they could see them. The drawing on the left is a portrait of me drawn by Angelica. Lovely! The drawing on the right is a bird drawn by Myriam. Myriam also drew a portrait of me, but I can’t find it and I’m upset because it was a beautiful drawing. I drew portraits of them, so we had a great exchange! Thank you girls for a wonderful day! Serendipitous!PS – The pink is from some juice that got knocked over onto the drawing. I think it suits my personality! The first one is definitely you talking! I agree – the pink suits you. The bird has a great attitude – is he wearing a necklace? It really is me, right? I didn’t ask the artiste if it was a necklace, but I think it’s the cross. These kids were adorable. So cute.